On this day (April 24), 105 years ago, Wilbur Wright allowed a photojournalist to ride along as he flew an exhibition flight for the King of Italy, providing the very first piece of motion picture filmed from within a moving plane. It was the groundbreaking work of the Wright brothers combined with the growing needs of business travelers gave birth to the business aviation and private charter industry in the early part of the last century. As the country came out of World War II, business boomed and the demand for business focused private charter flights went with it. The private charter and private jet industries responded by leveraging the skills of seasoned pilots and maintenance technicians, retrofitting military planes left over the war, and investing in new private aviation technologies like the jet engine to build what is now a thriving $15B industry. Here is a look back at how we got from there, to here. 1937 – Beechcraft introduces the Model 18, also called the Twin Beach, which is specifically designed for transporting business executives around the country. It proved that there was demand for private business flights specifically catering to the executive community. 1939 – The first jet engine aircraft takes to the air, opening the door for long-range travel. 1947 – The Corporation Aircraft Owners Association, which will later become the National Business Aviation Association, is formed. 1954 – The Morane-Saulnier Paris jet makes its first flight. 1957 – Lockheed introduces the JetStar which marks the beginning of the business jet. 1958 – Grumman introduces the Gulfstream I, the first executive jet to cost more than $1M. 1963 – Bill Lear flies the Lear 23, the first plane that would be known solely as a business jet. This plane is now on display in the Smithsonian’s National Air & Space Museum in Washington, D.C.
1963 –FedEx begins service with a fleet of 31 Falcon 20s. 1966 – The Gulfstream II ushers in the age of the large-cabin jet. 1969 – The Cessna Citation 500 launches the legacy that will become the Citation XLS, the most popular private jet in the world. 1970 – The Honeywell TFE731, which will prove to be the most popular engine for private jets across almost all private aircraft manufacturers, is introduced. 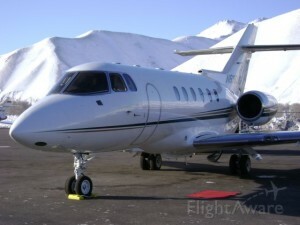 1986 – Fractional ownership is introduced and transforms the market for private jet charter travel. 2006 – Cessna introduces the Citation Mustang, the first VLJ or very light jet. Current Fleet Photo – Hawker 800A N816LX available for Private Jet Charter. Photograph by David Biernacki.